CONSUMER/DEALER NOTIFICATION, DISCLAIMER OF LIABILITY AND INDEMNIFICATION OF CANADIAN DIESEL ONLINE, INC.
CANADIAN DIESEL ONLINE, INC. (“CANADIAN DIESEL ONLINE”) IS A DISTRIBUTOR OF AFTERMARKET AUTOMOBILE PARTS. SOME OF THE OFF-ROAD DIESEL PRODUCTS THAT CANADIAN DIESEL ONLINE DISTRIBUTES HAVE THE CAPABILITY OF DISABLING OR TURNING OFF EMISSION CONTROLS ON CERTAIN VEHICLES (“PRODUCTS”). YOU ARE HEREBY ADVISED THAT THE SALE, INSTALLATION, OR USE OF SUCH PRODUCTS IS PROHIBITED IN THE UNITED STATES AND CANADA, AND THAT THE SALE, INSTALLATION, AND USE OF SUCH PRODUCTS MAY ALSO BE PROHIBITED IN OTHER COUNTRIES. (5) TO IMPLEMENT POLICIES AND PROCEDURES TO ENSURE THAT YOU AND YOUR OFFICERS, DIRECTORS, EMPLOYEES, AFFILIATES, DISTRIBUTORS AND AGENTS COMPLY WITH APPLICABLE LAW AND THE REQUIREMENTS AND PROHIBITIONS SET FORTH IN THIS DOCUMENT, AND TO ENSURE THAT YOUR CUSTOMERS ARE ADEQUATELY ADVISED OF APPLICABLE LAWS, RESTRICTIONS AND PROHIBITIONS PERTAINING TO THESE PRODUCTS. ANY SALE, RE-SALE, USE, OR RE-USE OF ANY PRODUCTS IS AT YOUR OWN RISK. YOU HEREBY AGREE NOT TO USE, INSTALL, OR RESELL THESE TYPES OF PRODUCTS unless and until YOU—the undersigned dealer or consumer (the “Reseller”)—has carefully read this Customer Notification and Disclaimer of Liability (this “Disclaimer”). The Reseller must abide by all applicable laws in the place of sale and/or intended use, including but not limited to emissions, vehicle safety, environmental, and traffic laws. It is Reseller’s responsibility to know what those laws are and how they apply to you as a reseller and distributor. The sale and/or installation of this product (the “Product”) on a customer’s vehicle indicates that Reseller has (a) had the opportunity to inquire about applicable laws and (b) read, understands and accepts all of the terms of this Disclaimer. As noted above, these Products are capable of disabling or turning off the emissions system on some vehicles. Emissions-control deleting or disabling products may only be sold, installed, or used in locations where doing so is not prohibited or restricted by applicable law. Use of these Products in the United States is a violation of federal and certain state (including but not limited to California) environmental laws. Your customer’s vehicle will not pass emissions testing in the United States if the emissions system has been disabled. Reseller must advise its customers in writing of the need to be aware of applicable laws in your country and Canadian Diesel Online strongly encourages that Reseller requires its customers to sign and return an acknowledgment of such notice prior to sale as evidence of Reseller’s compliance with this requirement. Reseller is recommended to keep copies of these signed acknowledgments for a period of five years from the date of sale and make them available to Canadian Diesel Online upon request. Canadian Diesel Online is not responsible for any aspect of the Product’s installation, use and service. Rather, the Reseller/customer (or the Reseller’s customers, as applicable) shall be solely responsible for the installation, use, or service of the Product and any actual or alleged losses, liabilities, obligations, damages, costs, expenses, claims, actions, proceedings or investigations, including but not limited to damage to vehicle components, that result from such installation, use or service, or from any modifications to the Product made by the Reseller (or the Reseller’s customer, as the case may be). The Reseller/customer is required to fully understand and to educate its customers regarding the capability and limitations of any vehicle on which the Products are installed, and all installations must be performed in compliance with vehicle manufacturer specifications, warnings and instructions. The Reseller/customer agrees to defend, indemnify and hold Canadian Diesel Online (and its officers, directors, employees, shareholders, affiliates, successors and assigns) harmless from any and all losses, liabilities, obligations, damages, costs, expenses, claims, actions, proceedings or investigations resulting from any actual or alleged failure to adhere to such specifications, warnings and/or instructions. The Reseller/customer shall comply and require its customers to comply with all applicable laws when operating the subject vehicle. The Reseller/customer agrees to defend, indemnify and hold Canadian Diesel Online (and its officers, directors, employees, shareholders, affiliates, successors and assigns) harmless from any and all losses, liabilities, obligations, damages, costs, expenses, claims, actions, proceedings or violations arising from any actual or alleged violations of these or any other applicable laws. Reseller/customer shall consult his or her vehicle warranty before using a Product. Under no circumstances will Canadian Diesel Online be liable for the voidance or non-applicability of the vehicle owner’s warranty due to the installation of a Product. Rather, the customer assumes all risk and responsibility if a vehicle manufacturer and/or dealer voids the vehicle owner’s warranty due to use of a Product. Reseller/customer shall operate his or her vehicle at all times in a safe and legal manner. In no case will Canadian Diesel Online be held liable, and the customer assumes all risk and responsibility, for any property damage, personal injury and/or death that may occur in the event the Reseller or its customer operates the vehicle in an unsafe manner or violates applicable laws. THE RESELLER/CUSTOMER HEREBY ASSUMES ALL RISKS ASSOCIATED WITH THE SALE, INSTALLATION, USE, SERVICE, AND/OR RESALE OF THIS PRODUCT AND WAIVES AND RELEASES ALL CLAIMS AGAINST CANADIAN DIESEL ONLINE (AND ITS OFFICERS, DIRECTORS, EMPLOYEES, SHAREHOLDERS, AFFILIATES, SUCCESSORS AND ASSIGNS) OF ANY KIND OR NATURE, INCLUDING LIABILITY FOR PENALTIES, FINES, ACTUAL OR ALLEGED PROPERTY DAMAGE, PERSONAL INJURY OR DEATH, THAT MAY ARISE AT ANY TIME, TO THE FULLEST EXTENT PERMITTED BY LAW. ADDITIONALLY, RESELLER ACKNOWLEDGES AND AGREES THAT CANADIAN DIESEL ONLINE SHALL NOT BE LIABLE FOR ANY AND ALL INDIRECT, INCIDENTAL, CONTINGENT, SPECIAL OR CONSEQUENTIAL DAMAGES UNDER ANY CIRCUMSTANCES. THE RESELLER FURTHER AGREES TO INDEMNIFY, DEFEND AND HOLD CANADIAN DIESEL ONLINE (AND ITS OFFICERS, DIRECTORS, EMPLOYEES, SHAREHOLDERS, AFFILIATES, SUCCESSORS AND ASSIGNS) HARMLESS FROM ANY AND ALL LOSSES LIABILITIES, OBLIGATIONS, DAMAGES, COSTS, EXPENSES CLAIMS, ACTIONS, PROCEEDINGS OR VIOLATIONS ARISING FROM OR RELATING TO RESELLER’S FAILURE TO FOLLOW APPLICABLE LAWS IN REGARD TO THESE PRODUCTS. THIS DISCLAIMER IS A MATERIAL CONDITION OF CANADIAN DIESEL ONLINE’S WILLINGNESS TO SELL THE PRODUCT TO RESELLER/CUSTOMER. This waiver must be signed and returned prior to purchase of all products that are capable of deleting, disabling or bypassing emissions-control devices. By accepting the terms of this Disclaimer, Reseller is also (a) certifying that its resale of this Product will at all times be limited to sales solely intended for lawful uses consistent with the terms of this Disclaimer and (b) consenting to the disclosure of Reseller’s identity to any governmental entity responsible for regulating emissions and/or enforcing emissions laws. Please be advised that some of these products are identified by serial number and can be tracked by the manufacturer when they are registered and/or when the customer obtains updates for the device. If the manufacturer or Canadian Diesel Online learns that any of these products have been sold or used by Reseller or any of its customers in the United States (or otherwise in violation of the terms of this Disclaimer), then (a) the manufacturer or Canadian Diesel Online may, without prior notice, notify the user of the applicable law and ask them to disable or remove the device and (b) Canadian Diesel Online will discontinue all further sales of these Products to Reseller. Reseller will be solely responsible for any customer claims in respect thereof, including returns and refunds. All products and services of Canadian Diesel Online (CDO) and its subsidiaries and affiliates are subject to the terms and conditions of the applicable agreements governing their use. On rare occasions, erroneous price or availability listings may appear on our website or independently operated affiliate sites. While we apologize for the inconvenience such an error may cause, Canadian Diesel Online.ca reserves the right to correct inaccuracies at any time, with or without notice, and update any related orders. Canadian customers may be required to pay Canadian taxes on selective products available on the CDO website. Any unprotected E-Mail communication over the Internet is, as with communication via any other medium (e.g. cellular phones, post office mail), not confidential, subject to possible interception or loss, and is also subject to possible alteration. We do not encourage anyone to send personal or financial and Canadian Diesel Online (CDO) is not responsible for and will not be liable to you or any one else for any damages in connection with an E-Mail sent by you to Canadian Diesel Online (CDO) or an E-Mail sent by Canadian Diesel Online (CDO) to you at your request. Links from or to web sites outside the Site are meant for convenience only. 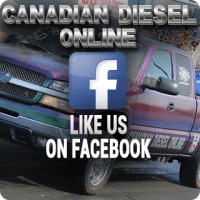 Canadian Diesel Online (CDO) does not review, endorse, approve or control, and is not responsible for any sites linked from or to the Site, the content of those sites, the third parties named therein, or their products and services. Linking to any other site is at your sole risk and Canadian Diesel Online (CDO) will not be responsible or liable for any damages in connection with linking. Links to downloadable software sites are for convenience only and Canadian Diesel Online (CDO) is not responsible or liable for any difficulties or consequences associated with downloading the software. Use of any downloaded software is governed by the terms of the license agreement, if any, which accompanies or is provided with the software. 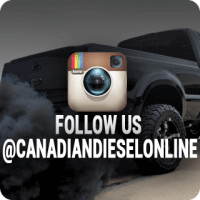 All content included on this site, such as text, graphics, logos, button icons, images, audio/video clips and software, is the property of Canadian Diesel Online and protected by Canadian and international copyright laws. Any unauthorized use of the materials appearing on this site may violate copyright, trademark and other applicable laws and could result in criminal or civil penalties.